If the key to keeping your resolution is taking small steps and rewarding yourself now and again—that’s a plan we can get behind! 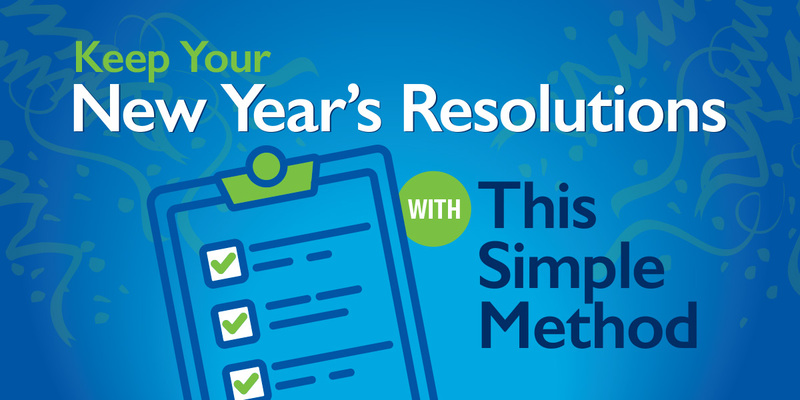 To help you slay your New Year’s goals in 2019, we took a look at the most popular resolutions and put together a handy list of tools to help you track your progress for each. Trying to lose weight, eat healthier or exercise more? Fitness goals regularly top the list of new year’s resolutions. Maximize your chance of success in 2019 by taking it one step at a time. This popular fitness app helps you keep track of your diet and exercise to make it easier to change those hard-worn habits. Plus, it connects you to a support network of other MyFitnessPal-ers so you can share tips and tricks, recipes and a little encouragement. It’s easier to eat healthy when those around you do the same. Learn to cook fresh, clean food on Naturally, Danny Seo, a family-friendly show that teaches the benefits of eco-friendly living and encourages your family to live healthier. Catch it on KWWL7 (HD807) or stream it on Hulu. Doing yoga for the first time can feel a little intimidating. If you’re not ready to give it a try in front of a classroom full of strangers, YouTube can help you test the waters in the privacy of your living room. Start by streaming Yoga with Adriene and get acclimated to the basics. Her YouTube channel features more than 400 videos to help you advance and build your love for one of the world’s healthiest, most relaxing exercises. *Cheat Day Bonus: Don’t forget to reward yourself! Check out Salt, Fat, Acid, Heat on Netflix and test out one of chef’s comforting, nostalgia-driven recipes that remind you of growing up. Changing your financial habits can be as tricky as switching to a new diet. Luckily, technology is on your side. If you’ve had problems sticking to a budget and monitoring your spending in the past, an app can bring a new level of organization to your money game. Download Mint for an eye opening look into how you’re spending—and turn saving into a game. Love podcasts, but hate talking about finances? Stacking Benjamins will help you see personal finance from a new light so you can actually enjoy the thought of saving. Sounds crazy, but trust us—there are enough exciting guests, creative ideas and a few jokes sprinkled in to keep you hooked. Feeling like a financial basket case? You’re not alone. Get inspired by watching chronic over spenders pull themselves out of financial disaster and learn to take control over their bank accounts on CNBC’s digital series, Saved – CNBC Make It. If these guys can turn it around—you can too! *Cheat Day Bonus: Come on down and treat yourself to America’s most satisfying game show! The Price Is Right probably won’t solve any of your financial woes, but you can’t be any worse for knowing the true cost of dandruff shampoo. Catch it weekdays at 10AM on KGAN2 or KGAN HD802. Overflowing laundry piles and stacks of dirty dishes can make you feel like your to-do list is out to get you. If you’ve never really had a handle on the whole organization thing, 2019 is your chance to tidy up your house—and your habits—for good. For some of us, our battle to stay organized revolves around our relationship with things—and our inability to part with them. The Life-Changing Magic of Tidying Up: The Japanese Art of Decluttering and Organizing helps you declutter your home and simplify your life by learning to let go. Check out this #1 NYT best-seller from organizational consultant, Marie Kondo for a spark of inspiration. The Minimalists podcast continues to explore the themes from the popular Netflix documentary, Minimalism: A Documentary About the Important Things from the same creators, and teaches listeners how to embrace a lifestyle that is less wasteful and less cluttered. *Cheat Day Bonus: Hoarders. This show is more of a cautionary tale than an inspirational story, but you can’t help but feel a like your mess is a little easier to clean after watching an episode. Catch it Sundays on A&E63 or A&EHD863.